When it's time to replace carpet with hardwood flooring, the next logical step is to update the stairs by removing the treads and replacing them. Since many homes and buildings were built with the intention of having carpet, this remodeling project can be difficult, expensive, and time-consuming. Help homeowners give their steps a new look for less by offering EZTREAD®. It is the first, solid-hardwood refacing system for stair treads and can be used on unfinished or previously carpeted stairs. EZTREAD goes right over the existing stair tread and riser. It allows access to the second floor during the remodel and keeps cost down. The EZTREAD® system consists of specially designed, easy-to-install solid-wood stair treads and risers that are permanently installed over existing staircases – it is not a thin veneer. Our products are very durable, and our customers have the ability to sand and refinish the treads and risers when normal wear occurs, just like regular hardwood floors. When you buy products from us, you'll also be helping more Americans get back to work. The EZTREAD® Staircase Refacing System is made in the USA. The support we have received in the last 12 years has allowed us to double our staff. 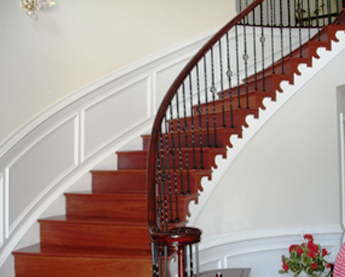 To meet your specialized stair needs, we offer a large selection of domestic and exotic accessories. We sell everything from handrails and newel posts to balusters. Our company offers custom size stairs and risers as well.